The Woronora Catchment south of Sydney has received over 171mm of rain since Wednesday which has resulted in Woronora dam rising from 95% percent full at the start of the week to 100% full. The storage started spilling on Saturday night for the first time since 2003. The storage is only slightly above full supply (+0.04m) with approximately 640 megalitre per day of water flowing over the wall since early Sunday morning. The storage is expected to continue to spill over the coming days as inflows continue. 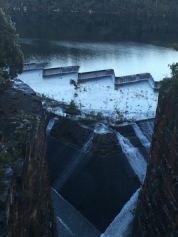 WaterNSW is working closely with the local SES and BoM to monitor the situation, but with inflows to the storage now reducing the spill from the dam is unlikely to impact local communities downstream. BoM is forecasting only light rainfall over the Woronora catchment in coming days which is unlikely to increase inflows significantly.